Improving airflow lowers boost air temperatures and increases density and oxygen content of air entering the engine. That amplifies power! Lower exhaust gas temperatures (EGTs) also improve fuel economy. When EGTs are tamed, the tuner doesn’t need to limit fuel delivery. So you get more power at any EGT. It’s very cool! 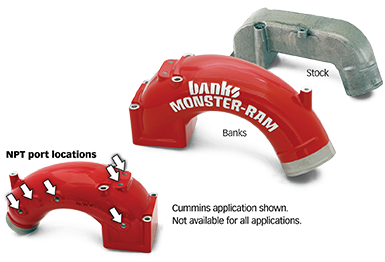 Banks air-to-air and air-to-water intercoolers eliminates restrictions with big boost tubes (most apps), huge inlet/outlet, thick core & rugged, streamlined all-aluminum end tanks. Increases boosted air density for higher continuous power & more MPG. Diesel turbos compress the air, increasing its density but heating it in the process. The intercooler removes that heat, which adds even more density. Boost gauges don’t read density, but the patented (and soon to be released) Banks Density Meter does. If your new intercooler resulted in a boost increase, fine, it’s less restrictive. But, did it improve the air density, is it cooling better as well? That’s what intercoolers do... they cool! But, they need to do this without blocking the air to your radiator which is just behind the intercooler. If the designer just made the intercooler thick, that won’t be an advantage if your engine overheats and the computer cuts back fuel to protect it. Now you have a power loss. A proper evaluation considers everything... and reveals the Truth About the other guys! This is the first measure of intercooler performance. If an aftermarket product can’t deliver a boost increase over the stock unit, there’s no point in even opening the box. All the units tested better than stock with Banks the clear winner… So far, so good. This is the reason for an intercooler in the first place. Boosted air that’s colder packs more oxygen. Cooler intake air and more oxygen lowers EGT’s, improves economy and unlocks your fuel’s power making ability. 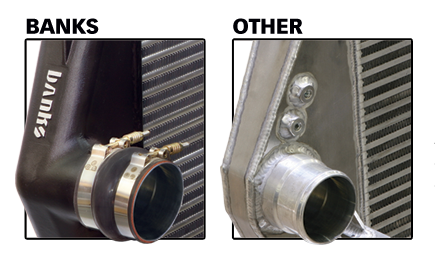 Measuring air density gain over stock is the most vital aspect of intercooler performance. This is where the Banks patented density measurement comes into play. Banks and AFE are both in the game but BD cooled so poorly that it actually lost density! If an intercooler blocks your engine’s radiator from the incoming airflow it needs, the resulting high temps cause the ECU to cut back fuel, leaving you with de-rated power and heat-related breakdowns. The point is to improve your vehicle’s performance, not cripple it. Spearco and AFE’s bar and plate cores block so much air to your radiator that it’s like putting cardboard in front of it. The final rating sums the three results above with a weighing of 20% for boost gain, 60% for density improvement and 20% for air flow-through to the radiator. When you add up the results of these tests it’s easy to see why Banks comes out way ahead: the Banks intercooler will produce quicker throttle response, higher continuous power at any exhaust gas temperature, better economy and a more reliable rig. All benefits and no compromises. Banks removes restrictions, reduces pressure drop from the boosted air, and significantly cools the air for greater density, oxygen content and power. CFD designed, rugged cast-aluminum end tanks ensure durability and slick air flow. The same can't be said for the welded-up sheet tanks. Air doesn't flow well with square corners, and the welds can break at high boost when performance is needed the most. Check It Out — See why Banks Intercoolers are the system you need for your truck!